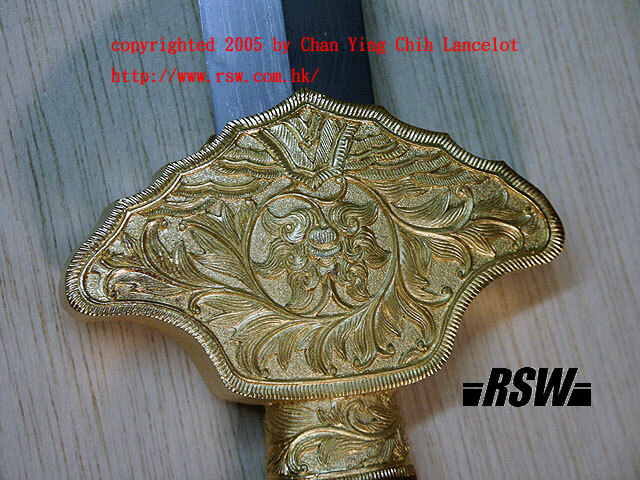 Basically I had never promoted the expensive artistic swords, such as this one. 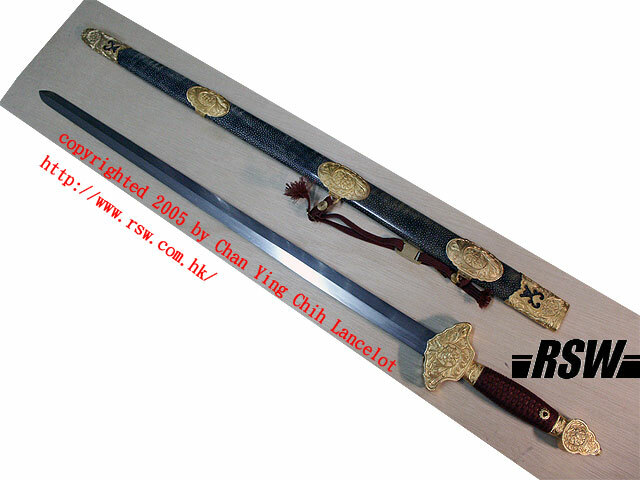 So I have to thank my Taiwanese customer for giving me chance to handle this sword. 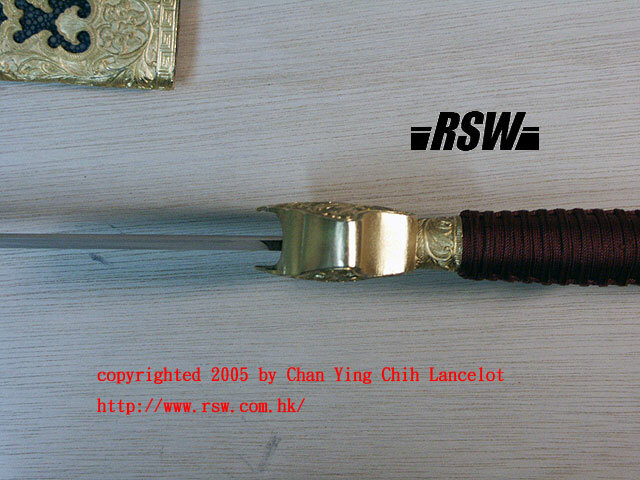 The story was that he ordered a Bagua two handed dao from Huanuosword but the company failed to deliver the product for three months due to some technical problems. 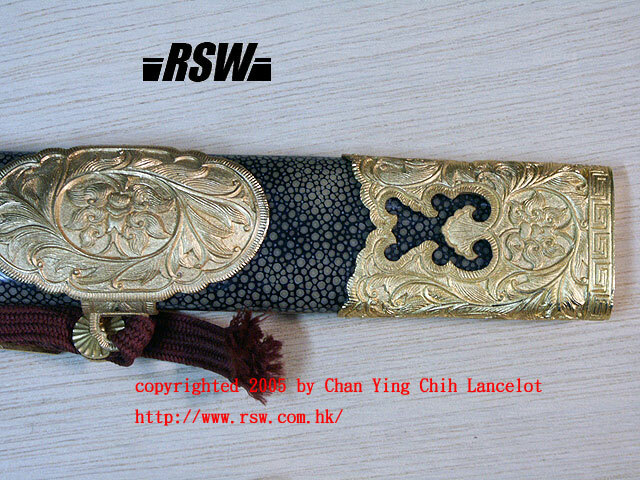 After discussing with the customer, he had agreed to switch to the monosteel Peony sword and requested for two bronze pegs to fill the hole on the grip also. 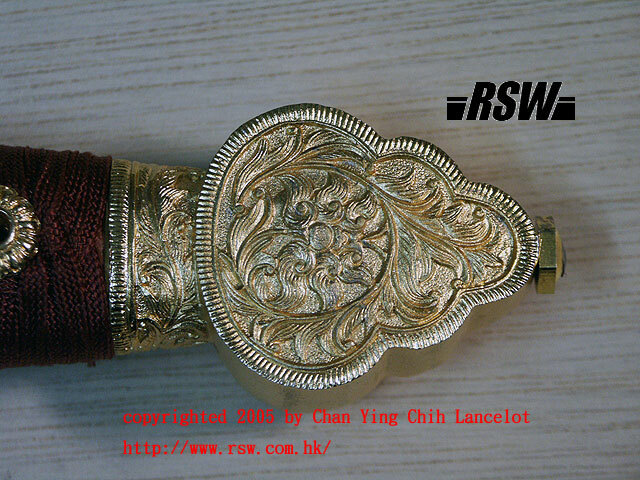 Despite Huanuosword had prepared the requested sword and a small gift to compensate for my customer's 3 months wait, they ended up sending their best version of Peony sword, the Royal Peony Sword (Gold-plated) actively, . When the sword arrived, the pegs promised by Huanuosword were missing and the sword's blade was rattling inside the hilt. The latter problem was solved by tightening the nut at the top of the pommel, though. Under inspection, the guard and the pommel were tilted slightly as shown below. Huanuosword said it was an error caused during the molding and it existed on both the Peony sword model and the Bat sword model. Other than that there were no problem on the fittings. 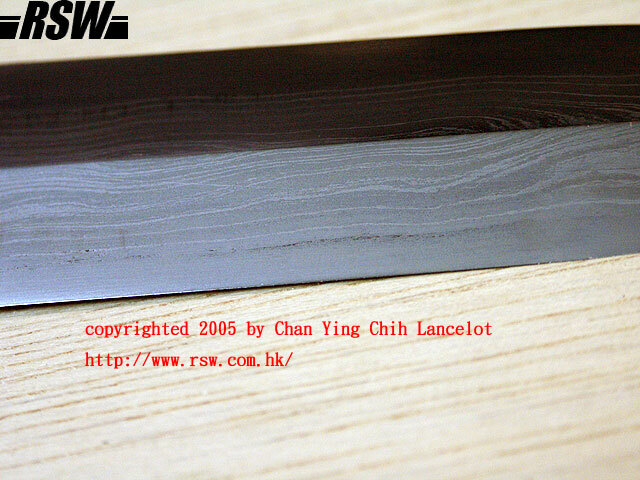 The blade was folded with Jia Gang (sandwitched steel with the hard one in the center) construction for sure. The finishing of the blade was not mirror polish as the mono steel version but equally smooth when touched with finger (not advised!). 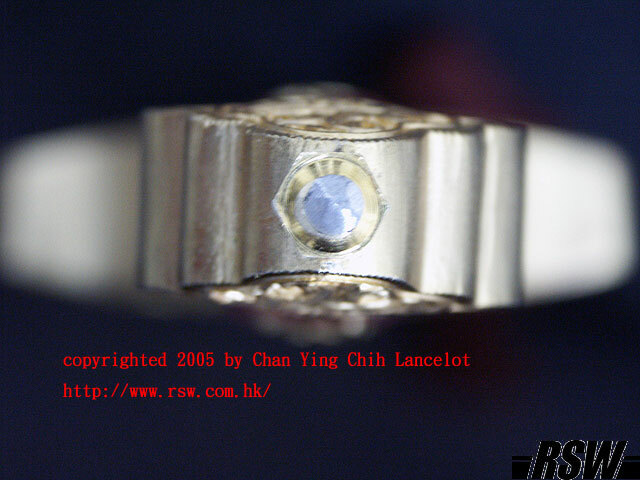 Also, the edges were formed by the polishing, making a flat grind cross section and were very sharp. There were grind marks on the surface of the blade and some spots of the grind was coarser than the other. However, compare to the mono steel version, the lines were more crisp and uniform. It seemed to show a tighter quality control than the mono steel version. 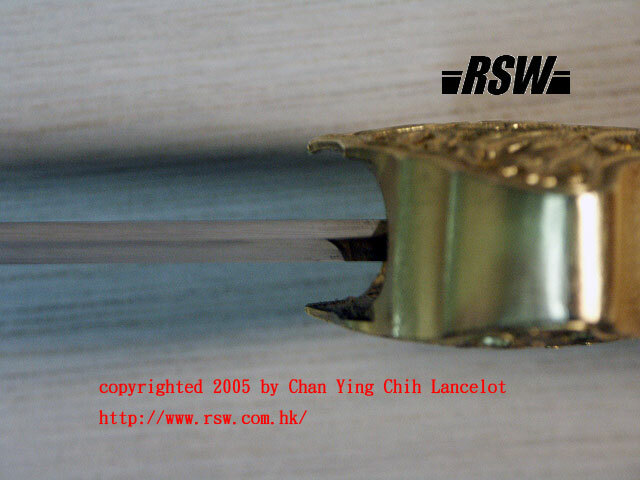 Huanuo suspected that the grind marks I saw were more likely the result of careless handling during the transportation, such as the blade bumping to the inside of the scabbard, or someone took the sword out to cut at something. 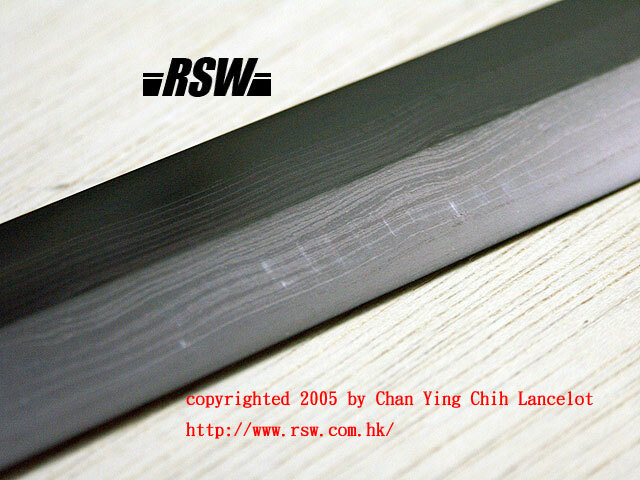 Huanuo claimed with honor that the grind marks were not there when the sword was finished at the factory. There were few swords that passed by my hands without being tested and this one was no exception. This sword was absolutely among the light and quick type. I cut two unfixed water bottles with it and the result was very good. The blade featured a wind breaking sound when the blade alignment was correct so this helped solo practice. Moreover, one of the bottles received three cuts before falling off the stand. It showed that the sword was very sharp. Afterwards, I spotted a handful of very slight light reflections on the edge where it was used in the test cutting, showing that the edge had dulled a bit. This could be due to the overly sharp edge that was prone to damage. On the other hand, the flexibility was good and sturdy because at the last cut, I was trying to avoid the wooden crate and dragged the sword laterally, swiping the bottle off. The blade was not bent and I could feel that the shock from the impact was dampened by its good sturdiness and flexibility. 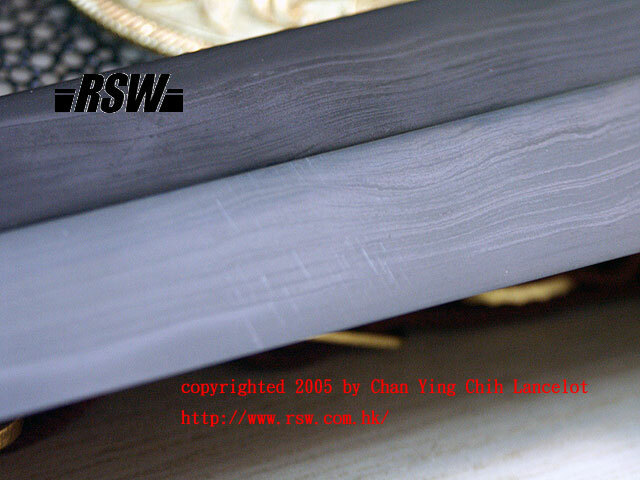 Then I tested its hardness with the hardness testing files and found that the edge was between 65 to 60 HRC, while the spine was between 55 to 50 HRC. It was different from the mono steel version they produce, which was uniformly at around 52 HRC. The result was a hardness higher than I expected.